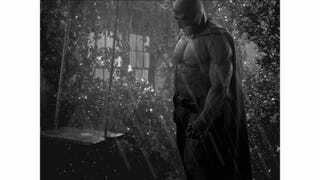 Yesterday, we got our first look at Zack Snyder's Batman—and one thing lots of Photoshop-savvy people on the internet agreed on was that Batman looked kind of sad standing next to his batmobile. And that's how the latest "Sad Batman" meme was born. The premise is straightforward: people Photoshop Batman into sad situations. The photoshop results go from hilarious to depressing, depending on what the situation is. Let's take a look, shall we?